British Telecommuniations (BT) has finalized a £ 12.5 bn deal to buy mobile operator EE from Deutsche Telekom and Orange. This article will first provide a brief overview of the European telecommunication industry and consequently the deal at hand will be analyzed from the standpoint of all three players involved. The telecommunication services industry can be divided into the fixed line telecoms market and the wireless telecommunication services market. The United Kingdom and Germany represent two of the largest European telecommunication services markets, accounting for a 13% and 16.9% market share respectively. 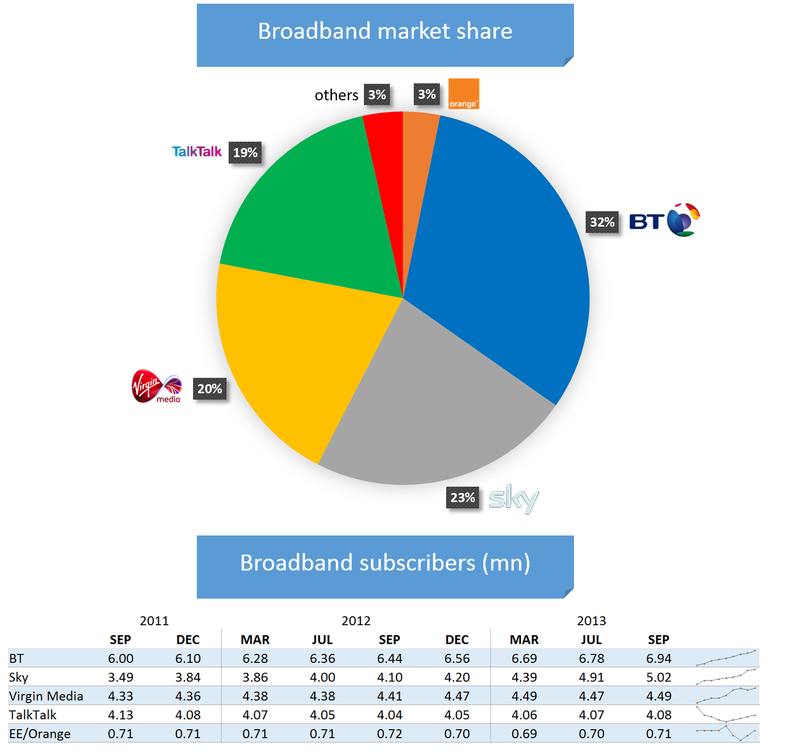 Performance-wise , the UK telecommunication services market generated total revenues of $44.4bn in 2014, representing a compound annual growth rate (CAGR) of 0.7% between 2010 and 2014. In comparison, the French and German markets declined with compound annual rates of change (CARCs) of 6.6% and 2.4% respectively, over the same period, to reach respective values of $40.2bn and $58.0bn in 2014. BT Group Plc. (LON:BT.A) is amongst the world’s leading telecommunication companies, with operations in the UK and more than 170 countries worldwide. BT is a dominant leader in the provision of fixed broadband networks to corporate and public institutional clients. BT’s business is composed by five lines : BT Global Services, BT Consumer, BT Wholesale, BT Business and OpenReach. In 2015, BT stated that it would focus on reducing its net debt while maintaining operational excellence (EBITDA and FCF growth) and advancing capital efficiency; further investments in R&D (including employee training) is a core goal for the 2015 financial year. An additional element is the focus on SMEs: BT’s Business unit operates in both fixed and mobile services and it is the second most important company unit by EBITDA. Current market conditions and the future prospects of the business make it the most attractive division to be improved and expanded. The group has a strong market position and operates in a favorable competitive environment with certain non-replicable advantages. However, adverse macro-economic conditions continue to force a corporate spending review, which in turn is expected to adversely impact BT’s growth prospects. Indeed, given a higher competition for fixed service in the UK, prices and revenues are falling; at the same time mobile device revenues are strongly growing, driven by increasing popularity of smartphones and tablets. The smartphone era has driven up data volumes while at the same time reducing revenues related to standard call and messaging services. Mobile apps, mobile security and machine-to-machine mobile services are future growth prospects. These facts combined highlight that a focus on SMEs could be the next big thing for BT, but that a solid mobile strategy is needed to appeal to clients in this segment. EE Limited is a private digital telecommunication company engaged in wireless services and fiber broadband networks. It was created through a joint venture between Orange and Deutsche Telekom. According to EE’s management team, EE remained the largest and fastest growing 4G mobile operator in Europe as of the first quarter of 2015. Its 4G customer has reached 9.3 million and hopes to reach 14 million 4G mobile subscribers by the end of 2015. 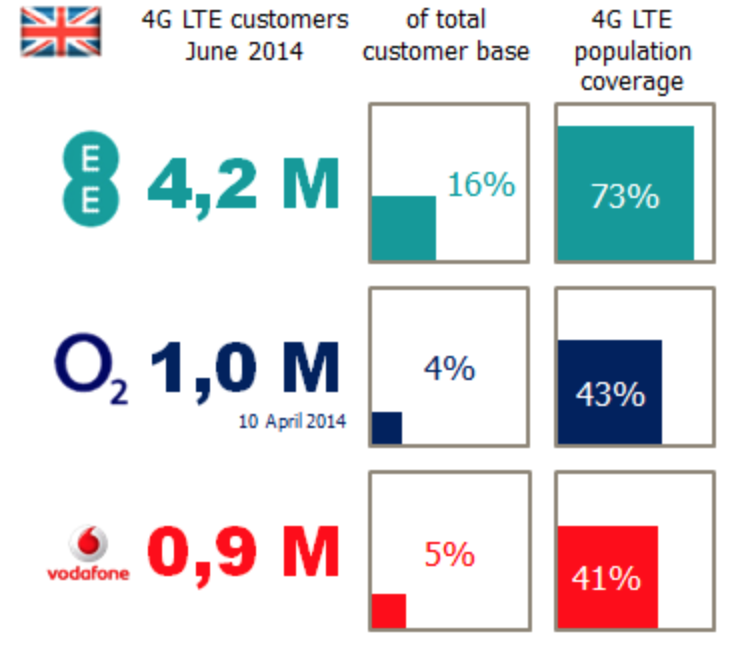 It can be seen from the infographic above that EE is the UK’s undisputed leader for 4G customers. Cost synergies are estimated to be around £3bn (after a period of 4 years) and with integration costs around £500mil. The transaction values EE at an EV/EBITDA multiple of 6.0x and 9.6x operating FCF (these figures were already adjusted for CAPEX and OPEX synergies). Through this transaction, Deutsche Telekom will get a 12% stake in BT and the right to appoint one board member in the holding company. 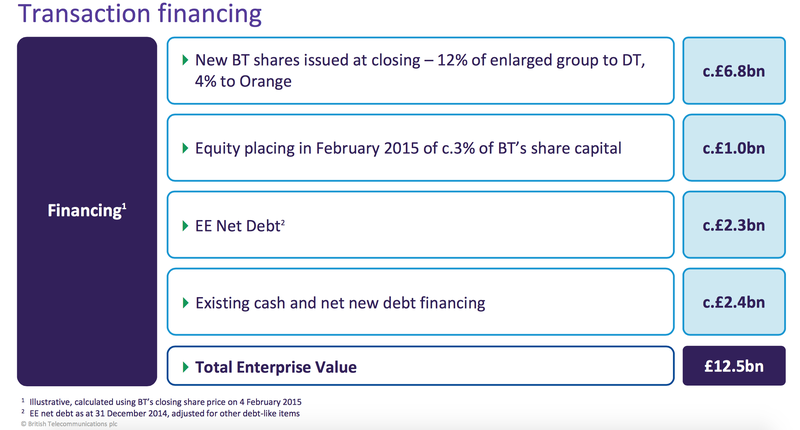 On the other hand, Orange will get £3.4bn in cash and a 4% stake in BT Group Plc. The market seems to appreciate BT’s plan: the trading day after the announcement of the transaction, BT Group Plc’s share surged 5%, to 444 pence while London’s FTSE 100 dropped 0.14% to 6,850.21. The deal was proposed for approval at the shareholders’ meeting on April 30th and is planned to be completed by the end of September. From our point of view the two businesses are highly complementary since there is only marginal overlap in terms of market share. BT will be able to bundle its existing broadband network with EE’s mobile offering and therefore provide customers with an increased product range. 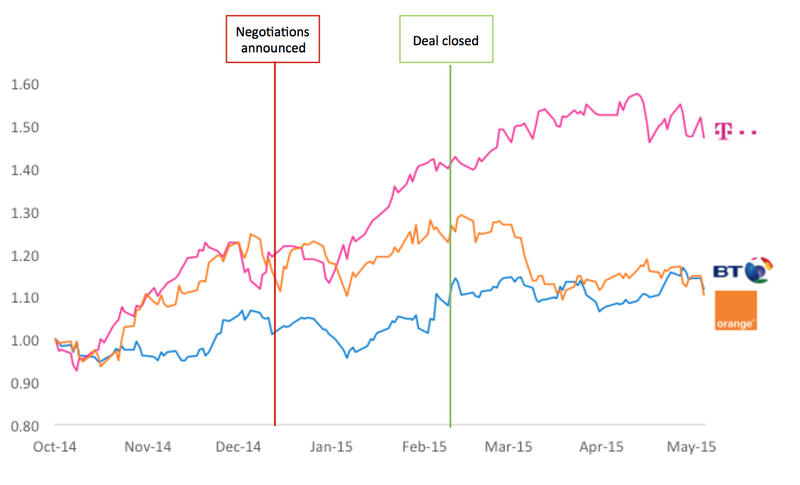 With its 12% stake in BT, Deutsche Telekom will be the largest individual shareholder. Therefore, Deutsche Telekom will have a strong influence in BT and share potential synergies in the combined entity. Furthermore, with the right to appoint a board member, Deutsche Telekom will be able to influence BT’s strategic decisions. After this transaction, Deutsche Telekom will be able to focus more on its core business: ISP (Internet Service Provider), whilst still benefitting from the stakes in BT. The 12% BT stake also represents an interesting acquisition currency; should the liberalization of telecommunication regulation continue in Europe, DT could use its stake to make acquisitions. By selling its stake in EE, Orange could lower its operating expenses that have been a consistent issue for the company in the past year. The company will still be able to benefit from the 4% stake in the holding company. Furthermore, Orange could use the cash obtained to repay the debt that it has on its balance sheet or support future M&A deals.